Implantable neuromodulation devices such as deep brain stimulators and vagus nerve stimulators, are widely used to treat neurological diseases. Most devices are composed of rigid probes that limit spatial resolution and increase mechanical mismatch with surrounding tissues for incompatibility in vivo. Novel approaches have focused on the structural design to include ultrathin syringe-injectable electronics and macro-porous mesh electronics for improved compatibility. 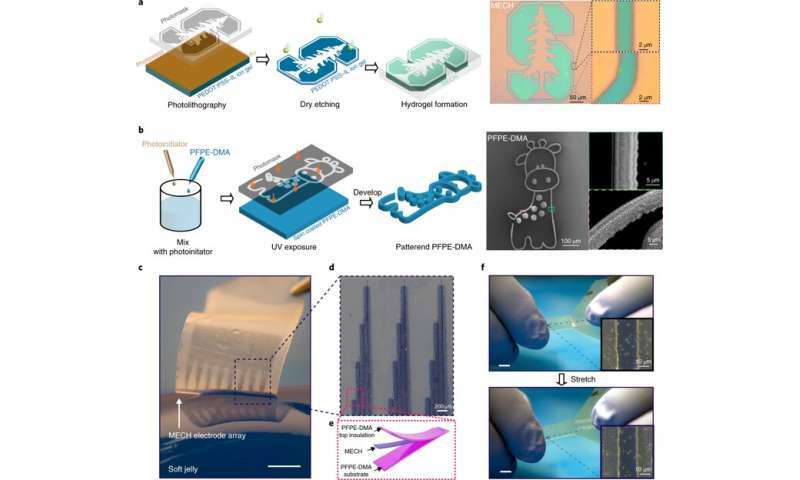 An alternative, low-cost approach is to develop stretchable microelectronics to form tissue-like biomaterials that use strain engineering methods to confer low Young's modulus and offer soft mechanical properties for flexible "elastronics" at the tissue level. The mismatch between implantable microelectronics and the surrounding tissue must be narrowed down to reduce immune responses after implantation and allow flexible movements in vivo. The design of implantable soft electronics is a challenge due to limited availability of suitable electronic materials. In a new report, Yuxin Liu and colleagues at the interdisciplinary Departments of Bioengineering, Chemical Engineering and Electrical Engineering at Stanford University describe a novel, electrically conductive hydrogel (ECH) biomaterial. In the study, they demonstrated an elastic microelectronics device with a Young's modulus lower than the tissue of interest. The system contained a highly conductive, soft hydrogel as a conductor and an elastic fluorinated photoresist as the insulation layer. Results of the study are now published in Nature Biomedical Engineering. The novel electrode arrays of the thin-film hydrogel are termed "elastronics." They are 20 µm in feature size, with significantly reduced interfacial impedance in the surrounding tissue. The system contains a current-injection density approximately 30 times greater than platinum electrodes and shows stable electrical performance under strain. The scientists demonstrated the use of soft elastronic arrays for localized, low-voltage electrical stimulation of the sciatic nerve in live mice. Hydrogels are commonly used for applications in biomedical engineering and tissue engineering due to excellent tissue mimicry and biomechanics. Elastic hydrogels possess remarkable ionic conduction for use as electrodes to build artificial muscle. 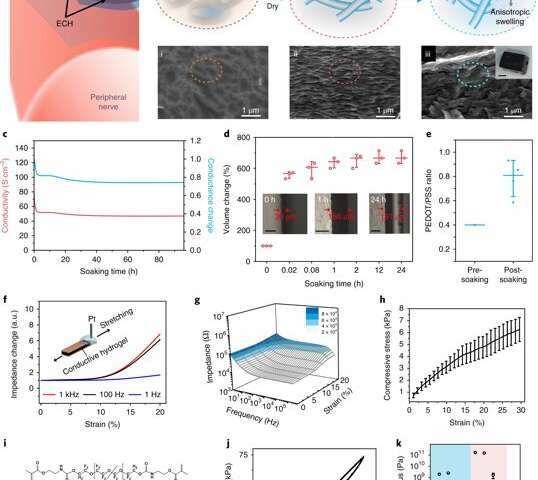 A purely ionic hydrogel is, however, not suited to engineer neural activity, since it lacks the required electronic conductivity for high-speed, single-neuron-single-spike activity. To narrow down the mechanical gap at the bioelectronic interface, it is possible to print a conductive polymer (CP) on a hydrogel, or create a conductive hydrogel coat on rigid electrodes for practical neural engineering. Yet, such methods are withheld by low electrical conductivity and an inability to implement micropatterning techniques on the biomaterials for precisely neuromodulating the soft electronics after implantation. As a result, there is an existing need to develop stretchable and insulating materials for neural engineering. The ideal material should efficiently prevent current leakage, be compatible with microfabrication strategies and have a Young's modulus similar to the surrounding tissue at the site of implantation. Liu et al. report on thin-film elastronics (tissue-like electronics) developed to interface with peripheral nerves for localized neuromodulation (control of neural activity). They prepared electrically conductive hydrogels (ECHs) with the expected conductance, patterned into a microscale thin-film structure. They then presented an encapsulating, stretchable insulation material (to prevent current leaks), whose Young's modulus was tuned to match nerve tissue in the surrounding microenvironment. The work included lithographical processes to encapsulate materials into a multielectrode array and measure aqueous stability and biocompatibility after implantation. The work allowed effective ECHs for electrical stimulation, with high current density and ultralow voltages as tested in a mouse model in vivo. During biomaterials fabrication, ionic liquids can be blended into a conductive polymer (CP) solution to form an interconnected ion gel film network. Liu et al. used this strategy and then removed the ionic liquid additive via water exchange to transform the ion gel into a hydrogel. The resulting electronic conductance of the ECH was significantly higher, as required for neural engineering materials. The scientists characterized the novel ECH biomaterial to understand its high electrical conductivity during ion gel to hydrogel transition using X-ray photoelectron spectroscopy (XPS) and scanning electron microscopy (SEM). On rehydration, Liu et al. observed volume expansion. The ionic gel contained a polymer ratio of PEDOT:PSS [poly(3,4-ethylenedioxythioephene):poly(styrenesulfonate)] by composition. Removal of the electronically insulating PEDOT polymer network contributed to the observed increase in electrical conductivity of the resulting material. They then measured the Young's modulus of ECH materials of varying polymer constitutions with compression tests via nanoindentation-based atomic force microscopy (AFM). The elastic modulus of the ECH materials were comparable to soft tissue such as nerve tissue. To micropattern the ECH electrodes, the scientists used traditional photolithographic patterning. They were easily able to pattern a desired geometry with a resolution down to a scale of 5 µm. Liu et al. developed a strategy to pattern the stretchable insulation layers with microscale resolution directly on the polymeric conductor to form a sandwiched electrode for the first time. The micropatterned ECH (MECH) stretchable electrode was surrounded by fluorinated elastic photoresist of dimethacrylate-functionalized perfluoropolyether (PFPE-DMA) monomer to form the top and bottom encapsulation layers. The freestanding device showed 20 percent stretchability without forming cracks. 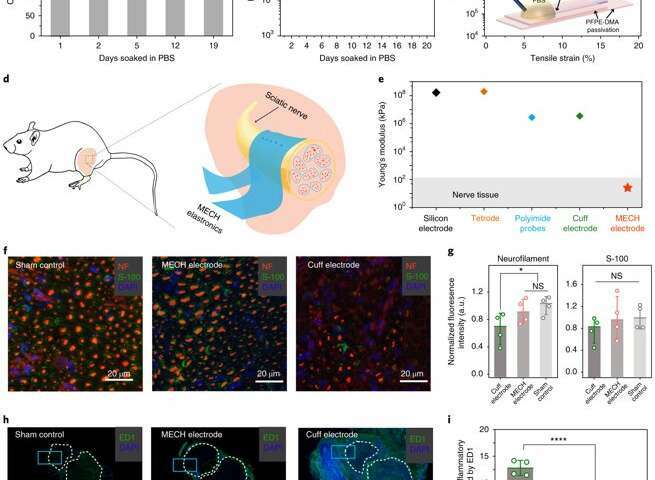 For long-term neuromodulation in vivo, the materials should maintain high charge storage capacity (CSC) and long-term stability in physiological conditions. In the experiments, the ECH maintained high CSC value after 19 days of incubation and MECH microelectrodes showed similar impedance stability due to excellent encapsulation by surrounding dielectric PFPE-DMA polymer. 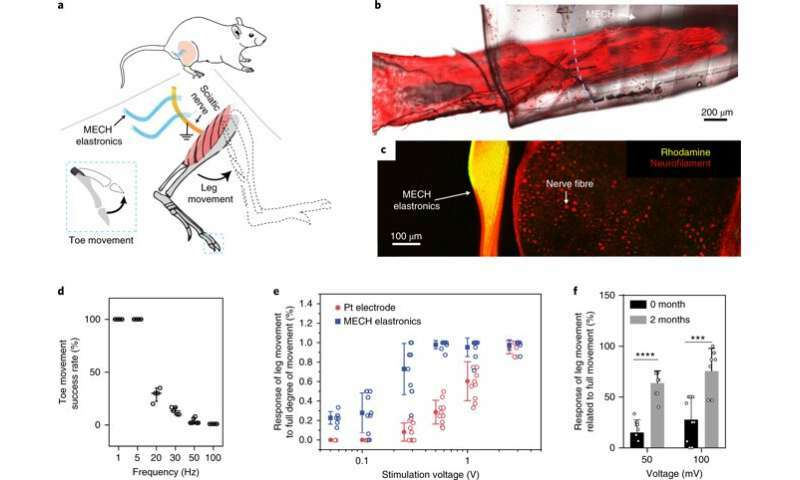 To understand the biocompatibility of MECH elastronics in vivo, the scientists implanted the free-standing thin-film device by wrapping it around the sciatic nerve of free moving mice for six weeks. For comparison, they also implanted flexible plastic cuff electrodes made of polyethylene terephthalate (PET) and a thin film of gold (Au). Since the Young's modulus of the MECH electrode was several magnitudes lower than conventional implantable probes. Liu et al. expected a significantly reduced mechanical mismatch at the device-tissue interface, and hence, a reduced immune response. As expected, they did not observe an immune response; measured with fluorescence intensities of neurofilaments at regions of the sciatic nerve implanted with MECH electrodes, but observed significantly reduced fluorescent intensities for plastic cuff electrode implants. The plastic cuff electrodes also induced significant inflammatory tissue growth around nerve bundles. Comparatively, the MECH electrodes only induced minimal inflammatory tissue growth. The results indicated enhanced biocompatibility of MECH with tissue during dynamic motion, along with surgical practicality in the process of implantation. As a novel biomaterial, MECH contained a porous microarchitecture, with excellent electrical and ionic dual conductivity, reduced interfacial impedance and high volumetric capacitance under physiological conditions. By optimizing the design of the electrode, Liu et al. 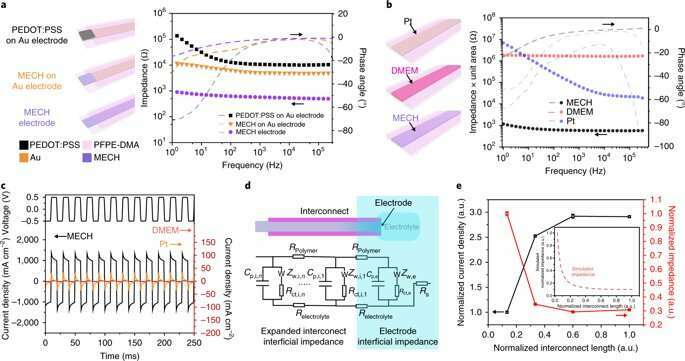 were able to deliver an excitation current density as high as 10 mAcm−2 at an ultralow voltage of 50 mV for neuromodulation, by contrast platinum electrodes of similar dimensions required at least 500 mV. Liu et al. optimized parameters to design an ECH biomaterial with the desired device microarchitecture using microfabrication techniques (MECH), transferrable to soft medical electronics. The new device developed with interconnects for neuromodulation mimicked the biomechanical properties of surrounding physiological tissue for tissue-like electronics. This strategy significantly reduced mechanical discrepancy at the bioelectronic interface to enhance mechanical coupling for significantly reduced immune responses, necessary for long-term implantation in biological systems. The scientists look forward to including MECH elastronics as implantable neuromodulation devices for clinically favorable applications in deep brain and vagus nerve stimulation. Liu and co-workers envision additional features such as system integration with large-scale microelectrodes for electrophysiological recording and biomolecular sensing. They will now further optimize and translate MECH elastronics from the lab to the clinic to produce next-generation multifunctional and miniaturized soft electronics.